We’ve all seen this popular meme and how PewDiePie did this with his £399 chair. If you think they are, you’re wrong. What Makes Gaming Chairs Look So Special? So, if they offer the same general features and functions, what makes racing gaming chairs seem so special and apart from office chairs? These gaming chairs replicate racing car chairs to supposedly provide the user a more immersive gaming experience. Differentiating the comfort and experience of a racing gaming chair with an office chair may be night and day to most, but not to some. 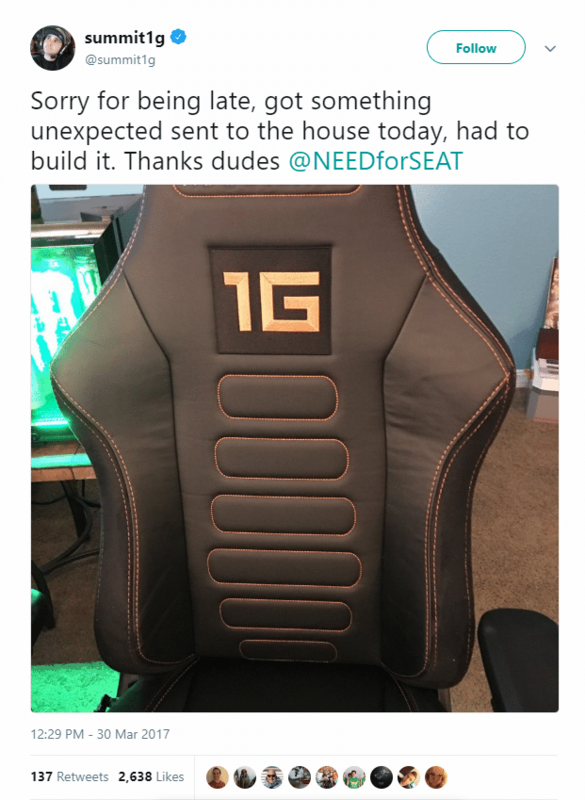 Below is summit1g’s tweet about how thankful he is for the racing gaming chair he just got from NEEDforSEAT. For those who don’t know, summit1g is the most popular Twitch channel as of February 2019, with 2.78 million subscribers. Racing chairs are initially designed to support your elevated legs as you reach the pedals when operating a vehicle. So playing games for hours on a racing gaming chair will not give you the utmost comfort unless you have something to elevate your feet. You may be the type of gamer who prefers elevating their feet when playing games but not everyone does - not me. but are the prices justified? It has become a trend that we actually pay for a decent amount for these accessories when you can actually do and possibly get more with a “non-gamer” rated one. Instead of paying more for high-quality memory foams, more cushions, and a better build for an office chair, you’re actually paying more for the name, the rated “gamer”, and the flashy lights for a racing gamer chair. At the end of the day, office chairs or regular gaming chairs are able to provide an outstanding comfort and convenience. They won’t be expensive if they aren’t ergonomically designed and comfortable in the first place. What Sums Up the Right Gaming Chair For You Then? Buying a gaming chair has to meet the factors that really matter to you. It’s easy for anyone to get attracted or distracted to racer gaming chairs because of how they could easily fit and compliment your setup or theme, but this might not be best for your needs. No matter if they are listed among the best gaming chair under $200 or the best gaming chair under $100, it has to meet your needs. Does it support your size and weight? There are gaming chairs specifically designed for small people and a list of the best gaming chair for big guys. Make it a habit to check the dimensions of the gaming chair to avoid making the wrong purchase. Is the height right for you and your desk? Keep in mind that height is yet another deciding factor you shouldn’t skimp on. It’s best to measure your table and your height ahead before making a purchase to avoid having problems at the end of the day. Is it compatible with extra gadgets and accessories? Premium gaming chairs offer more than just comfort and experience. Other manufacturers have taken the step ahead and provided you with options to attach extra devices such as a mousepad. Check what gadgets and/or accessories you can attach to the gaming chair to make upgrades and customization easy in the future. How many hours do you spend sitting on the chair? If you do spend a whole lot of time on the chair in general, opt for a really comfortable gaming chair and don’t settle for anything less. Choosing among the best gaming chair under $300 may sound promising but it’s going to be useless if it does not meet your standards. 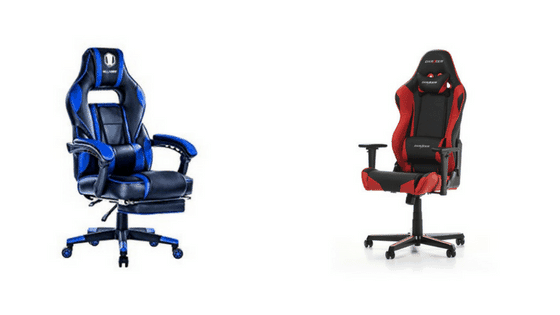 Consider these things and you should never make any mistakes in picking which gaming chair is best for your personality. We have tried a lot of gaming chairs here at WePC and we’ve casted our votes on which gaming chairs are best for different sizes and sitting behaviors. You can check our best gaming chairs review if you want the in-depth review - or you could check our personal pick below. 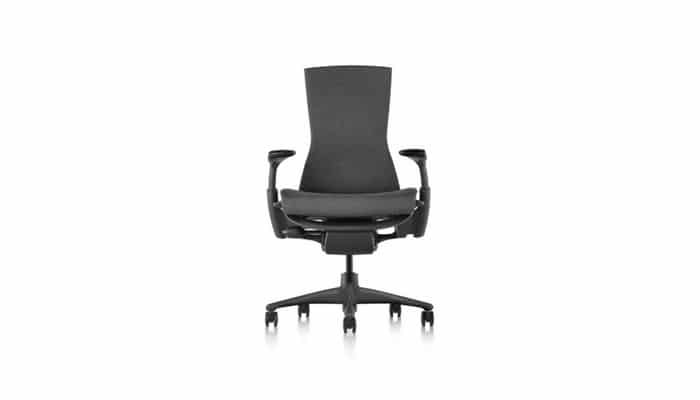 Herman Miller’s Embody chair is our personal favorite. We tried it out and we had to admit - it’s the best among the 10 popular gaming chairs we tested. It’s so comfortable that racing chairs felt like nothing compared to this chair. The ergonomics is out of this world and word has it that it gives you powers - and it’s true! Though all premiums come at a price, this one is worth down the last penny. Having all of these things laid out, I think we all agree what’s the answer to the question “are gaming chairs worth it?” so keep this in mind the next time you’re thinking of buying a racing gaming chair. It’s not to say that racing gaming chairs are just made for marketing purposes but it all boils down to personal preference. Do you own a racing gaming chair? How did it change your overall gaming experience? Share us your experience down the comments below!